Efficient lighting is essential additions to any outside entertaining or relaxation area. It helps to extend the use to the times when when the evenings get a little darker. Our high-quality options will allow you to offer practical, long-lasting solutions. For customers who like to read outside, or add some additional security around their property, then our LED lighting, that can be added to the Simplicity 6 Veranda, is a must have product. These efficient lights are incorporated in the back of the eaves beam and provide useful light for the whole space. It's not just about reading though. 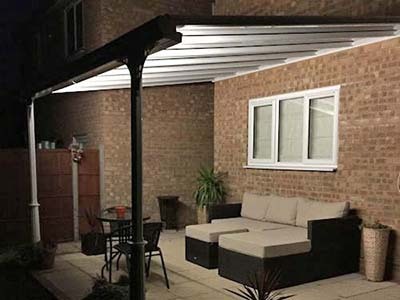 These safe and reliable lighting units mean evening parties and entertaining can go on well after dark, giving your customers increased flexibility to use their veranda at any time of the year. Combined with the heater they extend the amount of time that customers can use their outside space and therefore the value they get from their purchase.